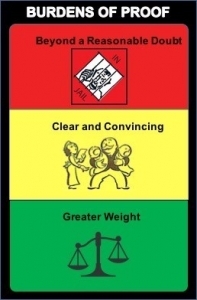 At trial, we use the chart above to explain the different burdens of proof that govern the decisions that jurors ultimately render for our clients. Since we are a personal injury firm that only represents people who were injured, we do not do criminal trials. However, we are well aware of the burden of proof that the government is held to in order to take a defendant’ life or freedom. It is the highest burden because it is the greatest threat. The government must prove its case “beyond a reasonable doubt” to take someone’s life or liberty. If the government wants to take a child from the parents, the burden is less than beyond a reasonable doubt. That burden is “clear and convincing” evidence. While that standard is not as high as beyond a reasonable doubt, it is still much higher than the burden of proof to resolve disputes between citizens. When someone’s life, liberty, or child is not at risk then the case is most likely filed in civil court. When there is a dispute between citizens and/or corporations, and money damages are to be determined by a jury then the burden is something less. It is called “greater weight of the evidence” meaning more right than wrong or more likely than not. We make these types decisions each and every day. We do not make decisions on who loses their life or liberty every day. In civil court, jurors are asked to resolve disputes. They are not asked to decide life or liberty decisions. That it is why the burden of proof is different and why we use demonstrative aids like the Burden of Proof chart in our trials. Our system of justice requires that jurors use the correct burden of proof for the type of case before them because that is what is fair for everyone. Wolfson Law Firm is a Miami personal injury law firm located in Miami, Florida. We practice entirely in the field of all types of accident, injury, and wrongful death cases. The firm routinely accepts trial referrals. It is a boutique law firm that represents clients, giving them the utmost personal attention. Wolfson lawyers help clients in all parts of insurance, injury and wrongful death claims, handling cases from initial investigation, through trial, and even appeals. Call us today for a free evaluation of your case at (305) 285-1115.